Unibilt markets its modular homes exclusively through a network of experienced independent building companies, who have been associated with Unibilt for 10, 20 or 30 years. Over 50% of Unibilt’s total production has been sold by our current Builder Network. 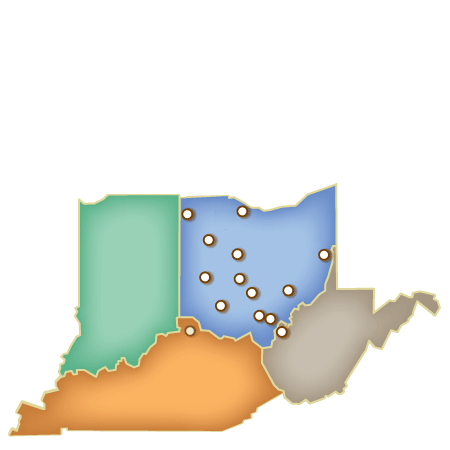 Our clients extend throughout Ohio, Indiana, Michigan, West Virginia and Kentucky. Center so that you can experience first-hand the variety of our designs, the quality of our work, and our efficient building methods. Your Builder will provide turnkey services to assist with site selection, home model choice, and all construction services needed to finish the home. All pricing must come from your builder. Due to the many site related variances, Unibilt cannot quote final construction costs. Pricing out your home plan to include all chosen options and site-related work. Put the finishing touches on your delivered home!